We are excited to introduce the RCA2610, the updated version of our popular Digital Attitude Indicator. Now with dual processors and anti-aliased screen for better performance and screen sharpness. Built to handle the high vibration environment in helicopters and yet, their light weight is perfect for soaring. The RCA26EK Series of gyroscopic Attitude Indicators are the culmination of over 60 years of experience in the design of electric attitude indicators. The Multi-Volt EK line is designed to be installed in virtually any aircraft regardless of its power system. This state-of the-art instrument is the ideal replacement for your older gyro. The RCA26AK (14V) and the 26BK (28V) gyro horizons have a proven track record for their dependability and ruggedness. The RCA22 Series of air driven precision gyros represent the ultimate in vacuum horizons in the General Aviation world. Made under the strictest standards, this instrument is built to give you years of reliable service. Get the standard blue, brown and yellow style or the striking blue, black & white Piper/ Cessna look! 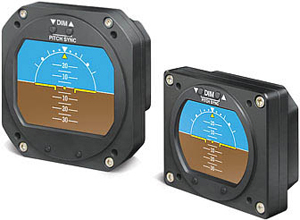 Don't forget to order our mini Slip Indicator to go with your new or current Electric Gyro or Digital Horizon! Adding the optional slip indicator to your instrument satisfies FAA AC91-75. See catalog for details.